Vladimir Nazarov, who tested vibration on cosmonauts in an effort to decrease the loss of muscle and bone mass in space. As there is minimal gravitational force in space, muscles and bones are not loaded as they normally are on earth. Cosmonauts (and astronauts) in space lose their muscular strength very quickly, which is why they are not able to easily walk when they come back to earth. The decrease of bone density increases the risk of bone fractures, so it's not safe to stay in space for extended periods. The aerospace industry in the former Soviet Union worked with vibration training. Before their departure, cosmonauts were subjected to special training sessions so that the density of their bones would increase and their muscular strength would rise. 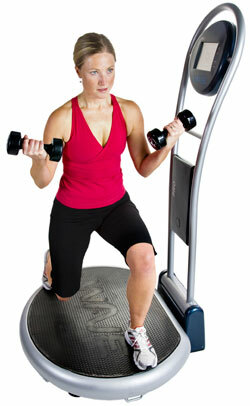 A particular form of WBV is vibration training, which is becoming increasingly popular. Initially, vibration training was mainly used in the fitness industry, but the use of vibration equipment is expanding quickly. It is now widely used in physical therapy, rehabilitation and professional sports, but it is also increasingly used for beauty and wellness applications. Don't let this formula scare you! All it simply means is the following: Whenever we exercise our muscles, we are using force to lift more or lift faster. There are two ways to get stronger: lift heavy weights (increasing the MASS to get more Force), or lift lighter weights but faster (keep the same weight but increase the ACCELERATION). WAVE vibration exercise works on increasing acceleration (rapid movement of the platform) rather than increasing the amount you lift, thereby placing less stress on your joints and ligaments. Gentle rapid contractions allow the muscle to work as a pump, resulting in increased blood flow within the circulatory system. This allows the body to carry off waste products much faster, thereby enhancing circulation and recovery. WAVE vibration exercise has a positive effect on bone. This is based upon Wolffe's law, which states that bone responds to the physical stresses put on it. Rapid muscular contractions with the WAVE will lead to increased strength and favorable stresses being placed on the bone.